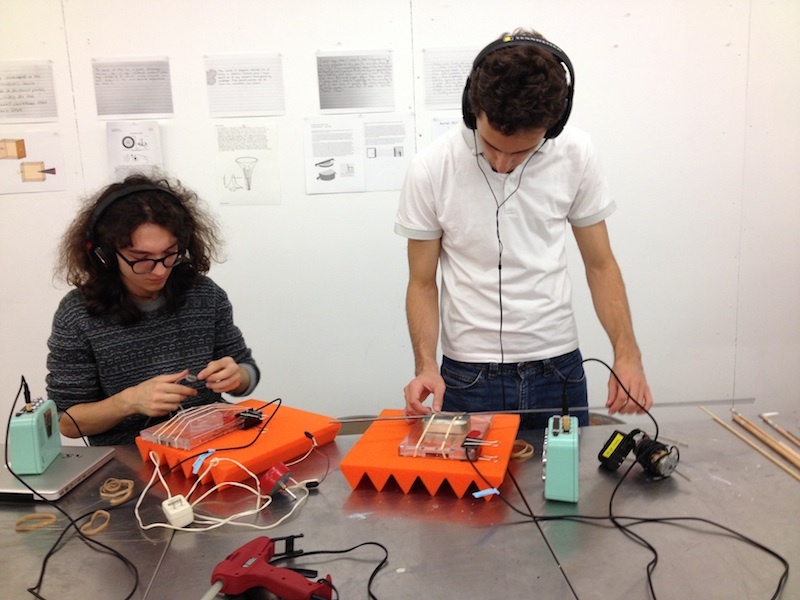 Sound Matters is an elective course that I created for the School of Design Strategies at Parsons. Rather than focusing on sound design, acoustics, or sound art, I am interested in looking across disciplines and encouraging students to consider sound as a transdisciplinary hub that sits between numerous practices. For this reason I encourage students from across the New School to take this course. This course is all about your ears. Starting with a focused attention to the sounds of the city, you will launch into projects that interact with, interrupt, or unmask the sonic world around us. Sound Matters is an explicitly interdisciplinary studio and offers the opportunity to create projects that might include field recording, sound collage, sound installation, audio intervention, performance, sound sculpture, drawing, or written explorations. The ultimate goal is to become a careful listener and to enter into a deliberate engagement with sound in your work. This simple project asks students to begin to make connections between their own history and memory and the their sense of hearing. How does listening differ from hearing? What kinds of sonic events burn into your memory and why? This brief project asks students to examine their chosen Aural History sound (see above) more closely and to propose a device that might isolate that particular sound. The device has few parameters, but it cannot be electronic and it must focus on the signal that they have identified in their initial written reflection. None of these devices are actually created and so students can propose ideas without financial or skill constraints. It’s worth mentioning that in early iterations of this course, I asked my students to create sound isolating devices and it was extremely difficult for many of them as it not only taxed their ability to understand the dynamics of sound, but in many cases their ability to craft such a particular object. In this theoretical version however, students were able to propose ideas that led to a discussion about the properties of sound, the physical presence of sound, the impact of materials, of space, the neurological aspects of sound processing, etc. This project begins with an in class building session in which each student uses the same base materials to create a sound generating device (or instrument). In this case students used plastic boxes, rubber bands, wire, hot glue and a variety of bits of hardware. Students amplify the object using a piezo pickup (contact mic) made the week before and attempt to elicit as broad a range of sounds from the instrument that they can. This session is followed the next week by an improv workshop lead by an improvising musician (2012 and 2014 were led by Aaron Moore and 2013 by Derek Baron). The group experiments with the possibilities on non verbal sonic conversation and end the day by creating improvised scores for projected films.